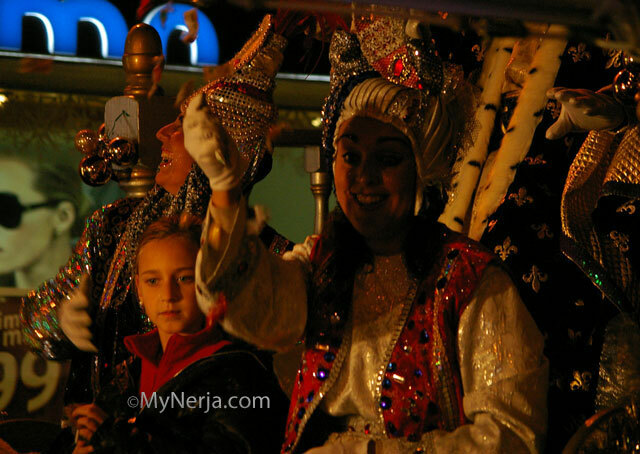 5th January – The Three Kings procession sets off at 5pm from Parque Verano Azul on the west side of Nerja (next to the Supersol) and parades through the streets of the town, throwing sweets to the crowds of children that come to watch. The procession ends up at the Church on the Balcon, where there will be a live nativity scene. The 6th of January is Three Kings Day (Los Reyes). This is the day that the Three Kings arrived in Bethlehem, it is also the most important day for the children over the Christmas period as the Three Kings in effect replace Father Christmas for Spanish children (although Santa is becoming popular) and on this day they get to open their presents. Pictures of last years Three Kings Parade in Nerja here. Have been to lovely Nerja a couple of times and thoroughly enjoyed every minute but would love to come for the January 5th three kings. Have seen it in Lanzarote and really enjoyed the atmosphere. Here's hoping.! Have been to lovely Nerja a couple of times and thoroughly enjoyed every minute but would love to come for the January 5th three kings. Have seen it in Lanzarote and really enjoyed the atmosphere. Here’s hoping. !